Increased knowledge of the skills necessary for clear, concise, accurate and respectful communication as part of the healthcare team as evidenced by obtaining 70% or higher on the final exam. 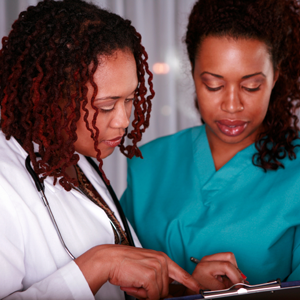 Effective workplace interactions are key to providing quality patient care. At the core of workplace interactions is clear, concise, accurate, and respectful communication. During this workshop, participants will learn how various communication styles and the role of active listening impact information delivery and interpretation. In addition, participants will practice applying these components to common tools and interactions in the workplace with the goal of continuously improving teamwork and patient care. Explain the role of communication in maintaining respectful team dynamics and quality patient care. Identify the components that make up effective communication. Apply effective communication components to healthcare team interactions. I am an organizational development professional and facilitator with over fifteen years of experience in both the profit and non-profit sectors. My goal is to inspire individuals, teams and organizations to achieve breakthrough performance. I do this by offering interactive, comprehensive, and impactful workshops that provide real-world skills for participants. I am a former trainer manager for a mid-sized multi-national organization where I developed and implemented many talent development initiatives. I have Masters of Arts in Organizational Management and Business Administration from Concordia University, St. Paul and serve on various volunteer boards in the Rochester community.